Coming out of the Convention, the Constitution counted slaves as 3/5s for the purpose of representation. At the Constitutional Convention, there was some debate over whether slaves should be counted as part of the population determining the number of seats in the House of Representative granted to each state. The Three-Fifths Compromise (also referred to as the Three-Fifths Clause) was the solution to this problem. It determined that five slaves would count as three people in determining the population for taxing and representation. 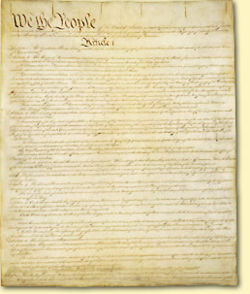 It was proposed in 1787 by James Wilson at the Constitutional Convention. The Compromise was introduced as a solution between the Southern and Northern States as a way to keep the union from splintering. Lincoln noted that "Necessity" was the only argument they ever admitted in favor of slavery at the time of the Founding. 4.1 The Fallacy of "Three Fifths of a Person"
Historians, politicians, and activists have argued endlessly about the Three-Fifths Compromise, what it means, and its impact. Frederick Douglass argued that the Constitution is a Glorious Liberty Document, which includes this compromise. Abraham Lincoln, likewise, made a defense of the Founding Fathers on the grounds that the Founders had little choice but compromise, otherwise one or more states could have been lost to the British so shortly after victory in the Revolutionary War. Conversely, William Lloyd Garrison argued that the Constitution was a "covenant with death" in regard to slavery. Other historians, such as Garry Wills, have argued that the Three-Fifths Compromise increased the power of the slave states. There are three potential outcomes that lead into the compromise, all of which have different outcomes and impact. 1: Total emancipation of the slaves, several southern states leave the union. 2: Total recognition of slavery, several northern states would likely have left the union. As Abraham Lincoln noted, dis-union was not an option for the Founders. Had any one of the states left the union, it would have been courted by a foreign power leading to another war. Even as a united nation of 13 colonies, the US faced war with Britain a second time in the War of 1812. 3: Partial recognition of slaves for the purpose of representation. Rufus King, a Delegate from Massachusetts to the Constitutional Convention, noted that counting slaves on an equality with free citizens would "excite great discontents among the states having no slaves". James Wilson agreed, stating that it would "give disgust to the people of Pennsylvania". Gouverneur Morris stated that given the choice of doing injustice to the southern states or to human nature, he would "do it to the former". Under no circumstances would he ever "agree to give such encouragement to the slave trade as would be given by allowing them a representation for their negroes". Ultimately, the Three-Fifths Compromise was approved on July 12, 1787, by a vote of 6 to 2. Previously, on July 11, the Three-Fifths Compromise failed to be approved by a vote of 4 to 6. What changed? On July 12, Governor Charles Pinckney proposed a motion for "rating blacks as equal to Whites instead of as 3/5". Fully counting slaves would have given the slave states immense power. The final vote was 2 to 8 against. The only two states voting yes were Georgia and South Carolina. After Pinkney's motion for full representation, the states agreed to partial representation. The admission of slaves into the Representation when fairly explained comes to this: that the inhabitant of Georgia and South Carolina who goes to the Coast of Africa, and in defiance of the most sacred laws of humanity tears away his fellow creatures from their dearest connections and damns them to the most cruel bondages, shall have more votes in a government instituted for the protection of the rights of mankind, than the Citizen of Pennsylvania or New Jersey who views with a laudable horror, so nefarious a practice. A small number of delegates to the Convention favored full representation for blacks, many of whom were southern delegates. Pierce Butler (Founding Father), a delegate from South Carolina, was ardently in favor of full representation. "I contend that representation should be according to the full number of inhabitants, including all the blacks". Wills also noted that in 1812 the total representation was 143, and in 1833, 240 members. The Three-Fifths Compromise was abolished by the Thirteenth Amendment, as was slavery. The Fourteenth Amendment clarified this, with Article I, Section 2 of the amendment stating that "Representatives shall be apportioned among the several States according to their respective numbers, counting the whole number of persons in each State, excluding Indians not taxed." Following the repeal of slavery and the Three-Fifths Compromise, there is a pervading myth that has become perpetuated that instead of being counted for the purpose of representation, that the Three-Fifths Compromise was all about deciding the value of a human's life. What this myth ignores is what historian Joseph R. Conlin points out, that the Three-Fifths Compromise counted free blacks as one full citizen. In other words, a slave was counted as 3/5 of a free black too. The Fallacy of "Three Fifths of a Person"
The fallacy that the Three-Fifths Compromise has long persisted, despite having no factual basis. Despite the facts, recognizing the historical facts have even gotten people in trouble. E.W. Jackson, a Christian Minister and candidate for Lieutenant Governor of Virginia in 2012 noted that "the 3/5ths clause was an anti-slavery amendment. Its purpose was to limit the voting power of slave holding states." Walter E. Williams, a professor at George Mason University, argues that the Founders were 100% correct in limiting representation of the slave power. He points to the fact that the South wanted to fully count slaves in their numbers for representation. Had slaves been fully counted, the slave states would have had more representation than the free states did. In 1793, the total count of representatives was 105. With a full representation for slavery, the slave states would have had 56, leaving the free states with 49. ↑ What to the Slave Is the Fourth of July?, July 5, 1852, "Fellow-citizens! there is no matter in respect to which, the people of the North have allowed themselves to be so ruinously imposed upon, as that of the pro-slavery character of the Constitution. In that instrument I hold there is neither warrant, license, nor sanction of the hateful thing; but, interpreted as it ought to be interpreted, the Constitution is a GLORIOUS LIBERTY DOCUMENT. Read its preamble, consider its purposes. Is slavery among them? Is it at the gateway? or is it in the temple? It is neither. While I do not intend to argue this question on the present occasion, let me ask, if it be not somewhat singular that, if the Constitution were intended to be, by its framers and adopters, a slave-holding instrument, why neither slavery, slaveholding, nor slave can anywhere be found in it." ↑ By the time of the War of 1812, 5 additional states had been added, with the result that Britain was still an extremely formidable adversary. Those states were: Vermont, Kentucky, Tennessee, Ohio, and Louisiana.